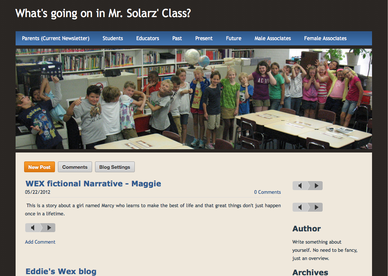 WEX - Writer's Express - What's going on in Mr. Solarz' Class? 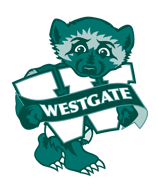 Thanks to http://www.wirelessgeneration.com/curriculum-instruction/wex/overview for the images, videos, and information on this page. Click on this image! It will take you to a website with an interactive version of it! Each section can be clicked on to watch a video about it! The lesson starts with a teacher-directed discussion in which students review a skill, learn about a new skill, or dig deeper into a skill that was introduced in a previous lesson. Students repeatedly work with one small aspect of a particular skill. 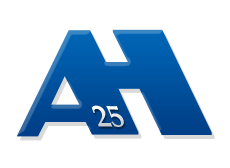 The procedures are simple, and the expectations are clear and consistent. Once a week students write in response to a revision assignment in place of the skill drill. A quick, in-class assignment allows students to practice a specific skill by changing or adding to something already written. The teacher asks a series of questions designed to trigger students’ memories and help them get a quick start on the writing prompt. Teachers post a writing prompt designed to elicit a specific skill; students respond silently and independently. As students write, the teacher circulates, whispering immediate, individualized feedback or direction. The class gathers to hear two or three students read their work aloud. After each reader shares, he or she calls on two or three classmates to respond. The teacher conducts a quick polling exercise that helps students notice connections to their peers and reflect on the day’s work. 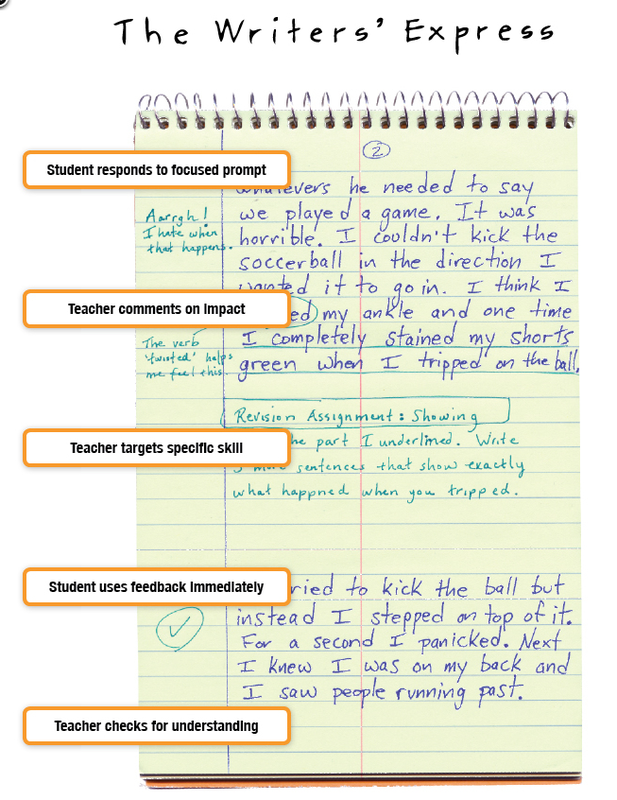 Teachers comment, track skills, and write revisions assignments. Comments show the student how specific details in his or her writing have had an impact on the reader and instruct them on how to move forward. Students practice the skill being taught and assessed in a stress-free practice situation. Students are encouraged to ask questions at this time and discover what challenges lie ahead before they write their formal piece. 1/3 of the class sits with the teacher in "Guided Writing," while the other 2/3 get into their "Writing Circles." Teachers post a writing prompt designed to elicit a specific skill; students respond silently and independently, while the teacher reads what they've written. As students write, the teacher whispers immediate, individualized feedback or direction, as well as a compliment. A quick, in-class assignment allows students to practice a specific skill by changing or adding to something already written. The teacher records the revision assignment, while the child completes it. If time allows, the teacher will review progress on the Revision Assignment at the end of the writing period. Every child is attended to every three lessons. Feedback is immediate and personal. Assessment is consistent and specific. Writing Circles gather to hear two or three students read their work aloud. After each reader shares, he or she calls on two or three classmates to respond. Everyone must share before anyone else gets to share again, so children are sharing about once per week. 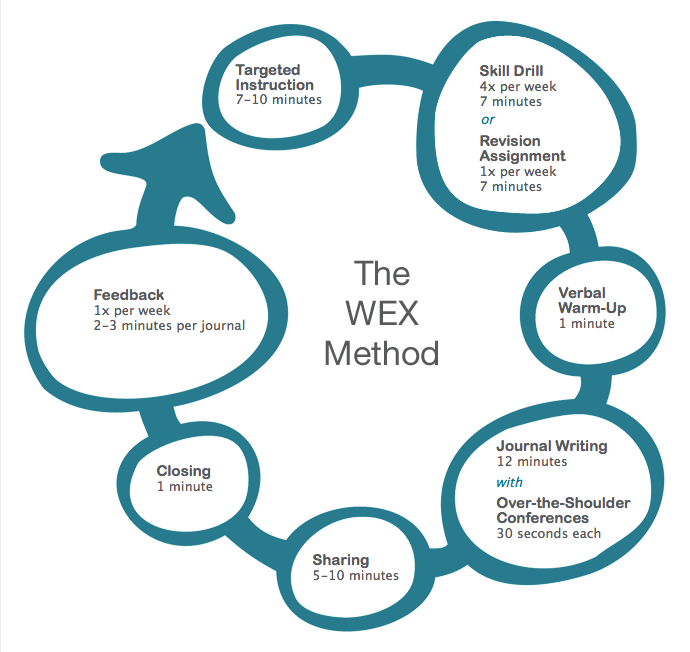 Click here to see our classroom's WEX YouTube video page with all six steps of our modified WEX process demonstrated! All of the students in class try to write at least a full page in response to a prompt during the 15-minute period of time. As the year progresses, students' writing endurance gets stronger. During the writing period, I verbally compliment each child who is in the Guided Writing group on something they are doing well (not written as shown to the right). This encourages students to keep taking risks in writing and increases self-esteem. I will also ask each child to revise one aspect of their writing based on my observations. This is where differentiation comes in, because if the child is completing the focused task of the day perfectly, I am able to assign revision assignments that are geared directly towards their individual needs. The student stops what they are doing and starts the revision assignment immediately so that they spend the majority of their writing time writing correctly. Once finished, they may continue their story. If time allows during the lesson, I check in to see their progress. If not, they have a written record of their revisions for me to look at when time allows. At the end of each module (there are three), students edit and revise a published draft that demonstrates their learning of the skills taught in that unit. We prefer to type our papers on a Google Doc, but often due to time, we record our story on a podcast instead. Ideally, we would do both. Click on image to the right to listen to our finished podcasts! Note: 5th Grade is Level C. Our district uses Books 1, 2, and 4.